The application is completely portable, meaning it can be run on your system without installation; perfect if you'd like to store it on a USB thumbdrive or other type of portable media. 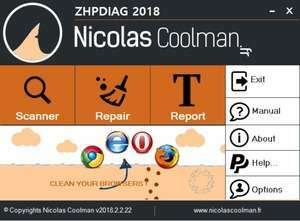 ZPHDiag features a very user-friendly interface containing three tools: Scanner, Repair and Report. All self-explanatory. Version 2019.3.1.27 is a freeware program which does not have restrictions and it's free so it doesn't cost anything. For security reasons, you should also check out the ZHPDiag download at LO4D.com which includes virus and malware tests. Additional screenshots of this application download may be available, too.